The other day I was in the car listening to an interview on one of Boston’s PBS stations with a man who was discussing the value that people put on objects they have created or put together themselves. He was using IKEA furniture as an example while stating that people who don’t make furniture feel pride over putting an IKEA chair together. He commented that few people in our society see tangible evidence at the end of the day of the work they have done. They have been doing work on the computer, or pushing papers, or both but have no object to show for it. He believes that we are programmed to want to see something tangible that we have created. That was thought provoking for me because part of the joy I find in all of my fiber activities is that I have created something. Something I had to give thought to, envision, and then I had to do something with my hands so that it came about. While intellectually I know that a lot of people in this world don’t care to create things, anything, most of the people I choose to spend time with outside of work do and that can skew my viewpoint. They aren’t all huge animal lovers and obsessed with fiber like I am, but they do things with their hands. Things that are slow, things that take time, things that make us forget time because we are so absorbed in them. On Saturday I went to a place where hundreds of my kindred spirits who thrive on making things with their hands congregated. 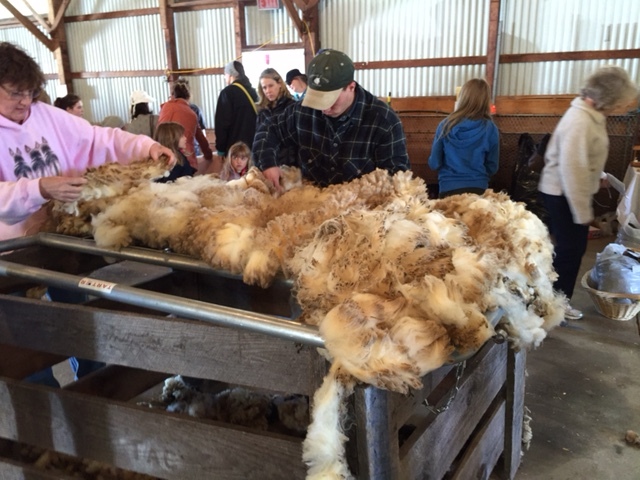 The 106th Connecticut Sheep, Wool and Fiber Festival. Here are some images from it. Doesn’t get much cuter than a tiny lamb in a sweater on a chilly morning. Normally a lamb wouldn’t be away from its mother at this age but her mother was unable to feed her so her owners are giving her bottles until she is old enough to no longer need them. a Dorset sheep on the other end of the spectrum, one that weighed around 250 pounds. The shearer was a woman who probably weighed half of that. She is very experienced so she knows the very specific techniques and positions to use so that she can keep the sheep relaxed and docile and allow her to shear it. I have never wanted to shear but I sure do like getting the fleece right off the sheep, getting rid of dirty parts and then using my hands and imagination to go through all the absorbing steps to get it to the point where it can become a sweater…maybe for a tiny lamb, who knows? 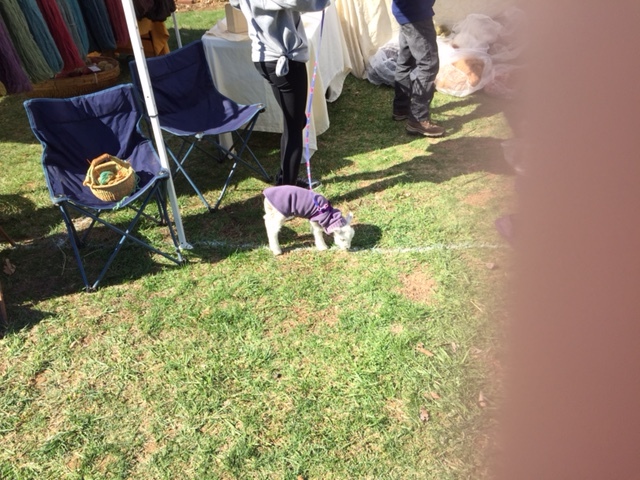 This entry was posted in Uncategorized and tagged creating with hands, CT Sheep Festival, Dorset sheep, fleeces, hand spinning, IKEA, lambs, PBS, sweater, wool fiber on April 28, 2015 by Betsy Alspach.